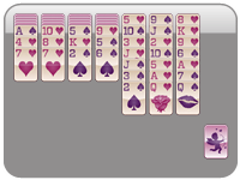 Yukon Solitaire just became kissable with this great Valentine's Day themed Yukon Solitaire game only from Solitaire Valentine.com! 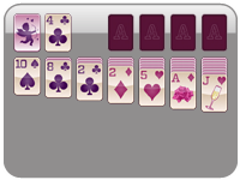 Get all 52 cards into the four foundations on the right-hand side of the screen in order to win Yukon Solitaire. 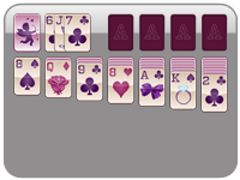 Just like klondike solitaire valentine, you can stack cards in descending order and opposite color. 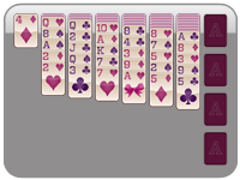 You will want to make as many cards visible as possible as early as you can, as you may move around any and all visible cards even if they are not in order. Challenge yourself this Valentine's Day with the love child of Klondike and Spider Solitaire, Yukon Solitaire Valentine! Alternate the colors of cards in each stack. 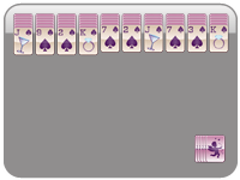 You can move cards in groups in the tableau. 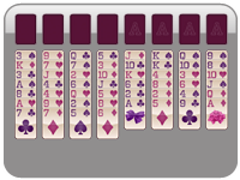 Transfer the tableau cards to fill the four foundations based on suit.